Are you a first time buyer looking to get on the property ladder? Buying your very first home can be daunting, after all it’s likely to be the biggest purchase you’ll ever make. Where do you start? What do you need to know? At Conveyancing Supermarket we have a wide range of advice and information to help you get started. Read on we’ll help you stay informed of what will happen at all stages of the conveyancing process. Generally, you need have saved at least 5% to 20% of the cost of the home you want to buy. For example, if you want to buy a home costing £150,000, you’ll need to save at least £7,500 (5%). If you can’t afford the mortgage on 100% of a home, the Government’s Help to Buy scheme/ Shared Ownership, offers you the chance to buy a share of your home (between 25% and 75%) and pay rent on the remaining share. You can buy bigger shares when you can afford to. Apart from your deposit and mortgage payments, there are others costs to pay when buying a home. How Much Will They Lend Me? The amount you can borrow is all about affordability. Lenders look at your income compared to your outgoings and work out how much you have left over each month. Some lenders are so stringent that even when you’ve paid debts off just before applying, they factor in how much available credit you have or see you as a risk if you’re using more than half the credit available to you. Once these calculations have been made they will want you to be in credit in your accounts in case mortgage rates rise. Mortgage lenders will ‘stress test’ you on a higher mortgage rate, typically 6-7%, to check if you could still afford to repay. LTV stands for ‘loan-to-value’ ratio (LTV), which is the percentage of the property value as a mortgage. In others words, it’s the proportion of the property value that you’re borrowing. To calculate this you subtract your deposit as a percent of the property value from 100%. If you pay a £20,000 deposit on a £100,000 home; that’s a 20% deposit, meaning you owe 80% meaning the LTV is 80%. Once you have a mortgage, you no longer have a deposit, so it becomes all about what proportion of the property’s value you’re borrowing. LTV is not just dependent on the deposit paid into your property, but also by house prices. This is crucial — by buying a property, you’re investing in an asset with a variable value. What Are Help To Buy ISAs Or Lifetime ISAs? The Help to Buy ISA was set up by the Government in 2015 and the Lifetime ISA in April 2017. People aged 16+ can earn interest on their savings of up to 2.53% tax-free and then get 25% added on top when they use it for a mortgage deposit. If you’re buying with someone who’s owned before, you can still get one but they cannot. If two first time buyers buy together, they can both get one. You don’t have to use it for a deposit. You can make withdrawals. You would still get the interest just not the bonus. The Lifetime ISA (LISA) is to help you buy your first home or save for retirement. You must be aged 18 or over but under 40 to open one. Here are the basics. The key to being prepared as a first time buyer is to do your research, arm yourself with knowledge and be organised and methodical. Buying your first home is an exciting milestone. Conveyancing Supermarket are here to offer useful help and advice. How Much Deposit Do I Need As A First Time Buyer? You need to save at least 5% to 20% of the cost of the property you wish to buy. For example, if you want to buy a home costing £150,000, you'll need to save at least £7,500 (5%). First-time buyers no longer pay Stamp Duty on properties costing up to £300,000. If the property is worth between £300,000 and £500,000, you will pay no Stamp Duty on the first £300,000, but will pay 5% on the remaining amount paid. The definition of a first-time buyer is a person buying a property who has not previously owned one and also has no property to sell. In other words anyone getting a mortgage who isn't a homemover, homeowner, buy-to-let investor or simply remortgaging is classed as a first-time buyer. If you are accepted for a mortgage and you have a poor credit history, you may face higher interest rates and/or fees. Borrowers with poor credit ratings may not have as much choice in mortgages as those with good credit scores. However, there are lenders who may consider those who have been rejected for mortgages elsewhere. Can You Get A Mortgage Without A Deposit? It is possible to get a mortgage without saving for a deposit first, but 100% mortgages are very rare. The only type currently available are guarantor mortgages, which usually require another homeowner to be named on the mortgage too. Can I Get A Mortgage With Bad Credit And No Deposit? Unlikely. Finding a 100% mortgage where there is no deposit is difficult. Even if you have an excellent credit history, you are normally required to provide at least a 5% deposit. So, getting a mortgage with no deposit and bad credit is unfortunately very unlikely. The loan-to-value (LTV) ratio is a term to express the ratio of a money borrowed to the value of property. 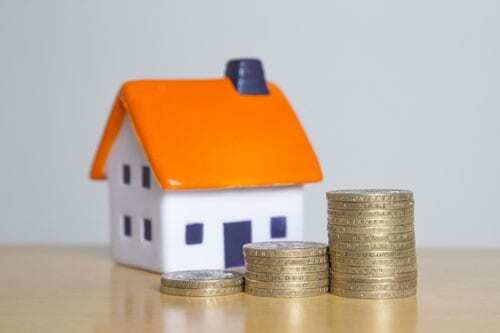 The term is commonly used by banks and building societies to represent the ratio of the first mortgage as a percentage of the total value of property. Will I Have A Greater Chance Of Getting A Mortgage For A New-Build Or An Older Home? Mortgage lenders typically favour older homes, as new builds are often harder to resell. Experience has shown new builds grow in value more slowly. To balance out this risk lenders often ask for larger deposits on new-build homes. How Many Times My Salary Will I Be Able To Borrow? Previously mortgage lenders calculated the borrowing amount from your salary, this has changed in recent years. Now they tend to use affordability criteria to calculate your borrowing potential. You will have to add up your monthly outgoings and deduct the total from your monthly income. The remaining income will be used to work out how much you can afford to borrow. If your outgoings are minimal you might be able to borrow between 4.5 and 4.75 times your household income. However, if you have lots of monthly outgoings the percentage could be a lot lower than this. How Many Years Does Mortgage Cover? Most mortgage terms are up to 35 years stretching to 40 years. Your age will be a factor as lenders will want to see you have cleared the mortgage, by age 70 or 75 in some cases.